Below is a chart showing the Shiller’s CAPE (or cynically adjusted price-to-earnings) ratio levels and corresponding market returns. The green bars represent the cheapest/lowest CAPE ratio whereas the dark blue represents the most expensive/highest CAPE ratio. As a reminder, the CAPE ratio is a smoothed P/E ratio. In essence, the valuation uses inflation-adjusted per-share earnings over a 10-year period, in order to smooth any variations in profit margins over a typical business cycle. 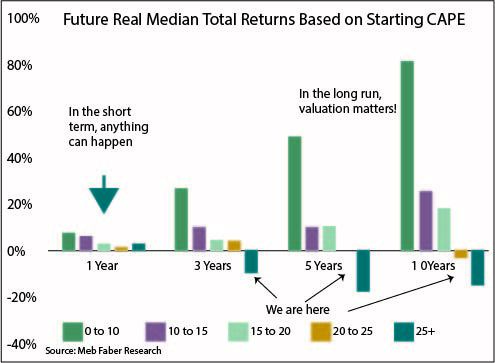 The point of the chart is to demonstrate that value investing can take time. You’ll notice that cheap valuations did ok in the first year, but given a 3, 5, and 10-year time frame, the outperformance was substantial. On the contrary, the underperformance of the more expensive valuations was notable as well. Buying undervalued securities may not reap benefits initially…in fact, you certainly can’t use valuations as timing tools. Staying fully invested and tilting to segments of the market that are undervalued is an excellent way to stay diversified, stay invested, and possibly reap higher returns over time.